You can tell by their sun-kissed cheeks and huge grins that it is officially summer. Like many children, my girls will spend the majority of their summer in the pool. So as their mom, it’s my job to ensure that they’re safe. Drowning is a silent threat, as seen in the tremendous number of children who die from drowning each year. Yet parents don’t see it as a risk. Knowing the facts should make us all more alert, but what else can we do to decrease the numbers? I had the pleasure of speaking with Santee Fire Department’s Battalion Chief, Tim Stuber. He shared some solid tips for ways to prevent drowning and keeping our families safe this summer. Use Barriers: Residential pools must be surrounded by a fence at least 4 feet high, with a self-closing and latching gate. Install alarms on doors and windows that lead to the pool to alert you when a child may be near. Don’t forget to cover your pool or spa when not in use. Teach Children to Swim: Enroll your children in swimming lessons or teach them yourself. You can start water safety skills at a very young age; even babies can learn to flip to their backs to float! Remember, however, that being able to swim does not completely prevent drownings. Younger children should also wear a U.S. Coast Guard-approved life jacket. 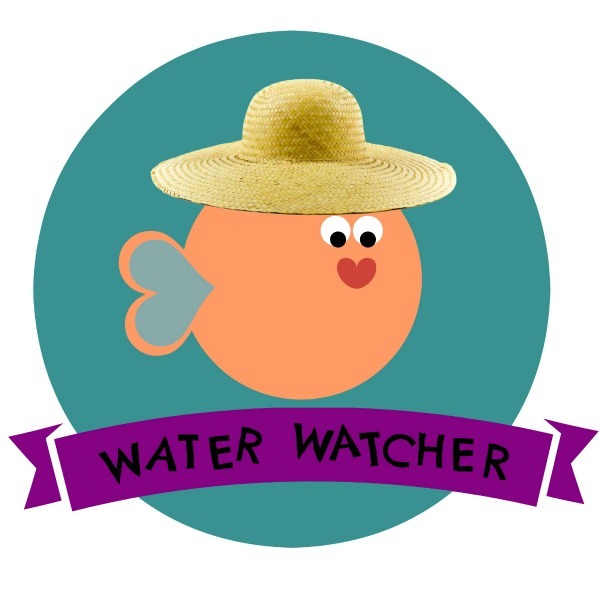 Assign a Water Watcher: Avoid saying phrases like, “I thought you were watching them” by assigning a Water Watcher, a responsible adult whose focus is watching the children. The Water Watcher should have water and a phone for emergencies nearby so he or she does not have to leave the poolside. Additionally, socializing should be keep to a minimum. I prepared a Water Watcher sign that you can print, laminate, and wear while on duty. When your shift is over, pass it to the next adult. This reminds everyone to stay alert and focused. Even with an adult standing by the pool watching, inexperienced swimmers need an adult within reach in the pool with them. Learn CPR: If there ever is an emergency, it’s critical to know how to help. Learn how to use the pool’s rescue equipment. It is also recommended that you learn CPR. Something that really stuck with me regarding water safety is that drowning is silent. At my girls’ swimming lessons last week, a student from the adult class grew tired and was unable to cross the pool. The lifeguard noticed her arms in the air and quickly pulled her out of the water. It was the lifeguard’s training that alerted her to a problem. The swimmer didn’t yell for help or make huge splashes while flailing her arms. A casual observer, such as myself, could have missed it. Summertime means lots of fun splashing, playing, and keeping cool. With these 5 ways to prevent drowning, we as parents can better safeguard our children from drownings. This is SUCH important information. Both of my boys can swim, but you really can never be too careful! These tips are so important. I keep an eye on my daughter every second that we are near water. Drowning scares me so much! Love these tips! Where we live everyone has a pool and we have too many drownings! I know CPR and my kiddo knows how to swim, but these are awesome reminders! Thank you for this. Prevention is key! These are all so important! Thanks for the awesome tips and reminders! These are really great tips. Water safety is so important in the summer. We have a pool in our backyard and there are always at least 2 adults paying close attention whenever there are kids in it. I learned CPR in school, but I have been thinking about getting re-certified. This is great tips , very useful guide there are all important thank you for sharing this . This is such great information. Even kids that know how to swim need to be supervised at all times. There are so many stories of children drowning who knew how to swim. THIS is my biggest fear in life with my children. I nearly drowned as a child when I was about 11 years old. I think I only survived because I was a strong swimmer on a swim team. It was terrifying, and I remember the terror of fighting to stay above the water. This is why my youngest always wears a lifevest until she is a stronger swimmer, even when she’s with me. It is so, so important, and people don’t realize drowning is a silent killer. When you’re swallowing water, you cannot yell for help. This is great and so very important. So many ways to prevent drowning. This is great for educating! We had a pool when my children were little and the first thing we did when we bought our house was put in a special safety fence around the pool. Great info! Swim lessons are so important for kids. One of the things I loved about the lessons my kids took is that they also showed the kids what to do if they saw someone drowning and there wasn’t an adult around. Rather than having the kids jump in, the kids were told to lie on the ground, throw a life preserver and then pull the person in. The teacher made them practice because she said often when someone is drowning, if a person jumps in to save them, they can drown too because of the panic and weight of the first person. Scary stuff! Very important to share. Good points. Assign a water watcher…This is such a great idea! You can’t let kids play in water without heavy supervision! Water seems harmless, but it’s so dangerous! So much info here, thanks. It’s scary how quickly a drowning can occur. It is so important to be aware of kids in water. Even shallow pools can be dangerous. These are great tips. This is great information and a very important reminder. I’m sharing so that my other friends can also read this reminder. This is such an important post. I made sure i had my kids in swimming lessons when they were younger. I do need to reamp my CPR skills. It has been far too long. I put my kids in swim lessons when they were young so that they would learn how to swim. Now they love swimming and swim competitively, but I think it is very important to at least have basic swim knowledge. These are some great tips and a great resource. I’m going to pass this along to my friends and family!! This is such an informative post, especially for us in Florida! Water safety is HUGE for us! It is so helpful to make sure that your home is prepared. We have a toddler and it is so important. A very important post to be read by all parents. Often a little negligence is enough to invite big troubles. All parents,caretakers and kids should have good knowledge of water safety. Loved the infographics.